FarGo Village are launching their very own street food Friday event this Friday! On the last Friday of every month, FarGo Village are inviting some of the best street food traders to come together in Coventry and cook up a storm from 6pm – 11pm! There will be drinks, great music, delicious street food and a fab atmosphere- this is definitely the place to be on Friday night. 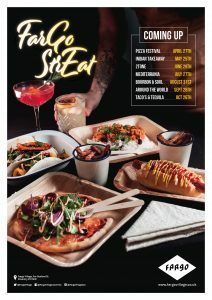 The first of FarGo StrEat was on Friday the 27th of April, we opened with our Pizza Festival! This event had a great turnout included street food from The Wandering Pizza Company, Bare Bones Pizza, Pizza Traders and Handmade Pizza Company. There was a range of toppings from classic Margherita, Cornish Brie & Caramelised Onion to a sweet Rocky Road pizza! After the Pizza Festival comes ‘Indian Takeaway’ on Friday the 25th of May, which will include all of your favourite Indian dishes!